Second important weaving center in Kordestan is a city named Bijaar. This city was built in shah esmaeil safavi era and selected as center of fertile areas named Goris or Gherus. Bijaar was wealthy and powerful until it got into degeneration in twentieth century. Nowadays most of Kurdish people from Gherus and Halvai and also some of Turkish and Afshaar people reside in Bijaar. Afshaar people are mostly living in north of the town, near to villages Tekaab and Tekaan Tappe that were inevitable to stay in this region following to compulsive immigration through the order of NaderShah in first half of eighteenth century. Bijar rugs are woven by using symmetric knot same as Sane rugs, with medium aggregation 2000 to 2500 knot in each square decimeter these rugs are woven in different dimension in small cushion and zar* and half size to large rugs. Sideways rugs are woven rarely. Traditionally, framework of Bijar rugs are completely made by natural wool used for warps and wefts are in red or indigo and cobalt-blue. Bijar rugs have three to five rows of weft of thick wool stay on between wates by using special metal tool or a heavy ferrous comb and weaving is done. Plenty of rows of wefts that are well combined are the reason for distinct appearance and hardness of Bijaar rugs. Lately, cotton is used instead of wool for warp, but some of the weavers use wool for underside weft, when there are three rows, wool is used for first and second rows and cotton for the third one. If number of rows will be five, wool is used for four rows and cotton is used for the fifth one between other rows. pile will cut off in enough length. 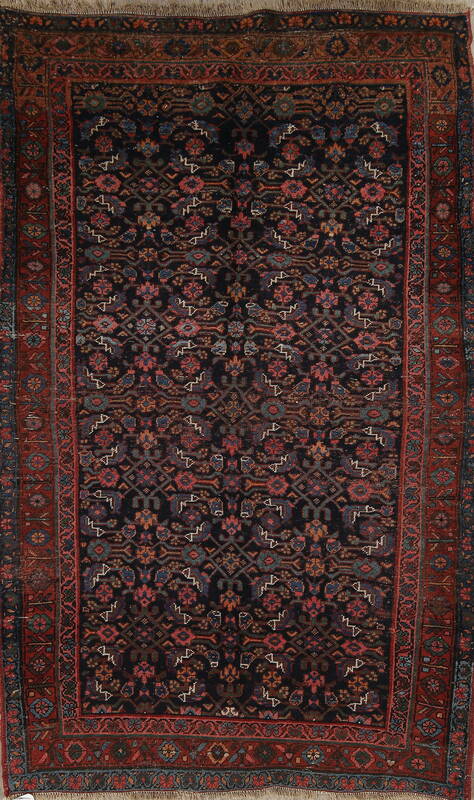 In Bijar carpets, you can see small Harati themes in which are common in “Saneh” but with less subtlety. The decorative schemes can be various: nested diamonds of different background colors decorated with Harati schemes, parallel medallions decorated with Harati schemes on background which has no extra decoration, or traditional schemes with medallion-corner designs on Harati grounds. There are other carpets which has uncommon designs but it’s a feature of Bijar carpets, having many paisley designs, with or without medallion, or having “Minakhani” schemes whose repetition in Bijar’s carpet in the last century causes the bringing up a theory suggesting that these schemes are original ones and are all from Kurdistan. Some of the Bijar rugs samples, have complicated flowering designs that ShahAbbasi and crab flowers are seen in them, connected to fully maze pedicles and stay on a series of networks that is kind of derived designs of Iranian decorative models on Safaviye era and in seventeenth and early eighteenth century. These rugs are mostly seen in Afshaar products; on the most of them some inscriptions are seen too help us to find time of texture that is between end of eighteenth century and first decade of twentieth century.